Fields of corn husks, maroon-colored ears of corn, coupled with the powerful narrative of Rowen White, a member of the Akwesasne Tribe of Mohawk, captures the opening scene of “Seeds of Hope,” the short documentary which tells the story of the Native American Seed Sanctuary. The Seed Sanctuary is an initiative to preserve Native American culture and foodways through seed saving. 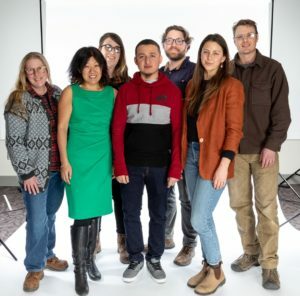 The project is a collaboration between the Farm Hub, Seedshed – a non-profit associated with the Hudson Valley Seed Company – and the Akwesasne Mohawk Tribe of northern New York. 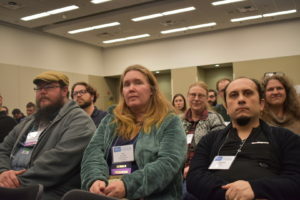 “Seeds of Hope” recently screened to a packed audience at the 2019 NOFA-NY’s (Northeast Organic Farming Association of New York) Winter Conference in Saratoga Springs, NY. 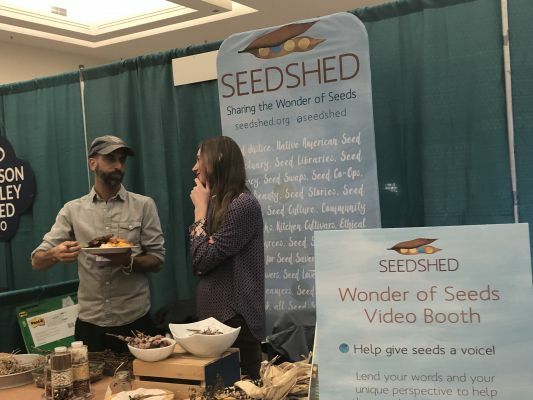 Now in its 37th year, the annual conference drew thousands of growers, gardeners, and consumers who share a common passion for creating an ecologically and economically sustainable food system. This year’s conference, themed “Climate of Change,” featured over 100 workshops across 13 tracks that included soil health and policy. The film, shot and produced by Oceans 8 Films, opens with a seed blessing ceremony that launches the traditional “Three Sisters” planting of corn, beans, and squash over nearly 30 acres of land on the Farm Hub. The screening at NOFA-NY also included a lively panel discussion moderated by Ken Greene, founder of Seedshed, and featured Raul Carreon, the Farm Hub’s post-harvest coordinator, Jay Goldmark, field crops production manager, White, and Karakwino Tina Square with the Native North American Traveling College and Ohero:kon rites of passage. Carreon offers a growers’ perspective when it comes to the Native American Seed Sanctuary. 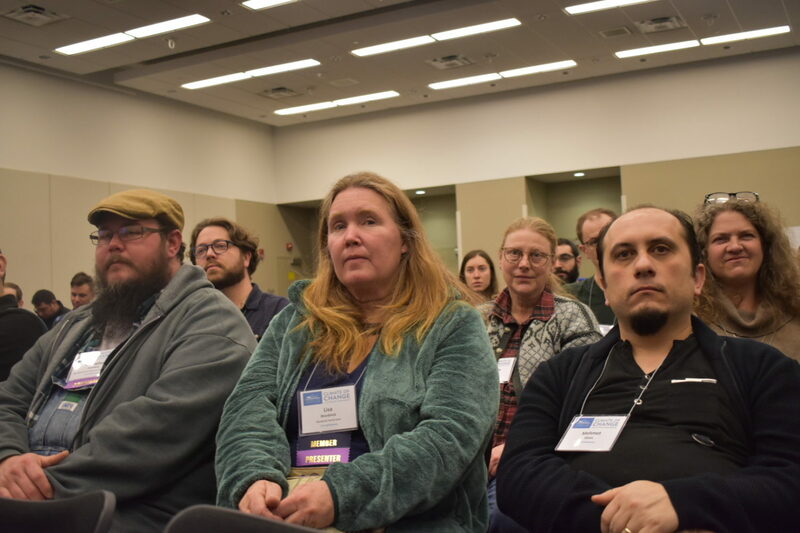 Hundreds attend “Seeds of Hope” screening and discussion at 2019 NOFA-NY conference. “I feel like it’s a story that needs to be heard, because people need to know how impactful seeds are when it comes to their stories, and to the lives of people who grow them and take care of them on a day-to-day basis,” Carreon says. The Seed Sanctuary also spawned further cultural and language exchange. For example, traditionally the seed ceremonies were conducted in tribal dialect, but the seed ceremony held at the Farm Hub in 2018 was also interpreted in English and Spanish in order to foster inclusivity. 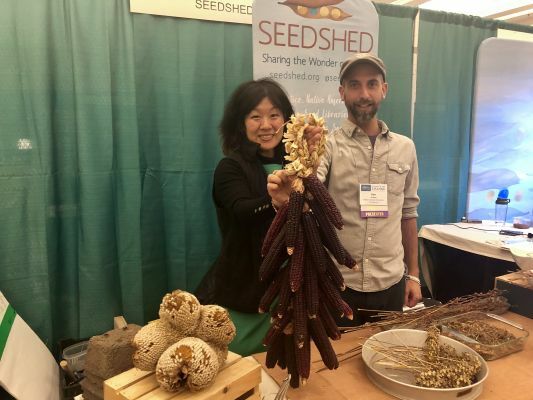 “I think it’s been an amazing collaboration,” says Carreon of the alliance between Farm Hub, Seed Shed, and the Akwesasne Mohawk Tribe of northern New York. Panelists also shared the impact the seed saving initiative has made on the Akwesasne Mohawk Tribe. The harvested seeds are used as part of the Ohero:kon rites of passage, a traditional coming-of-age ceremony for youth. Vegetables such as squash grown as part of the Seed Sanctuary have been shared with an Akwesasne school and used for school fundraisers and student meals. “We need to feed all these people and we’ve tried to bring in more traditional foods to introduce those foods [in the community]’,” Square says. The Native American Seed Sanctuary will continue this spring, with White hoping to add more tribal varieties and expand distribution and education. 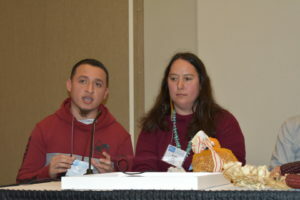 Raul Carreon, the Farm Hub’s Post-Harvest Coordinator, was as a speaker at three workshops including the “Seeds of Resistance” workshop featuring an all-star panel Soul Fire Farm’s Leah Penniman, Rowen White, Karen Washington, and Carolina Saavedra. Leah Penniman, co-director of Soul Fire Farm in Grafton, NY, gave an engaging presentation “Farming While Black: African Diasporic Wisdom for Farming and Food Justice” and was also the keynote speaker. Soul Fire Farm and the Farm Hub have an ongoing relationship to collaborate on initiatives and programs. 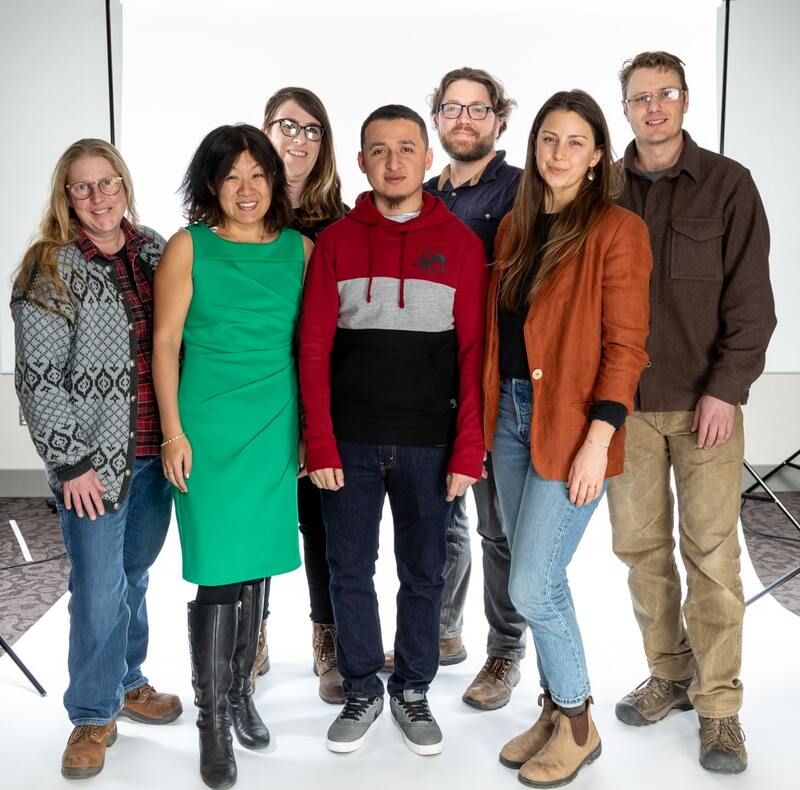 Farm Hub staff who attended included Jeff Arnold, Jaime Cardoso, Raul Carreon, Jess Clancy, Jen Crettien, Nailah Marie Ellis, Danielle Fontaine, Jay Goldmark, Jesus Gonzalez, Jayne Henson, Jeff Scott, and Amy Wu. 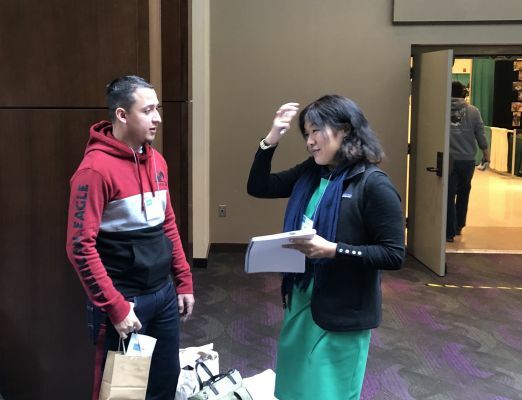 Jeff Scott, marketing and logistics coordinator, joined the conference’s “grains track” to attain more information and connect with experts. Since 2013 the Farm Hub has hosted an ongoing small grains trial in partnership with Cornell University and Cornell Cooperative Extension of Ulster County to gather data on a variety of grains with a goal of sharing information with area growers. “With our grains program here at the Farm Hub, I wanted to hear what others were doing to see if I could glean any information from their experience and apply it to our own. I also wanted to connect with some of those experts to be able to continue the conversation down the line,” says Scott. 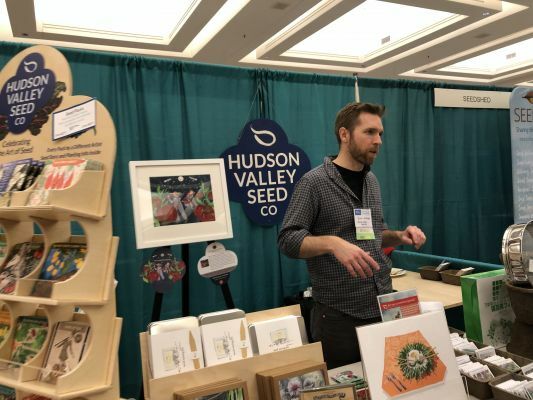 One of his favorite workshops at NOFA was on buckwheat presented by Thor Oeschner of Oeschner Farms and Amy Halloran, author of “The New Bread Basket.” “I learned that you don’t necessarily have to dehull the seed before milling it into flour. The hulls can be mostly sifted out and just add a bit more flavor and lots more fiber to the flour,” says Scott. Featured image: “Seeds of Hope” Screening and Panel Discussion. From left to right: Raul Carreon, Rowen White, Ken Greene, Tina Square, and Jay Goldmark.